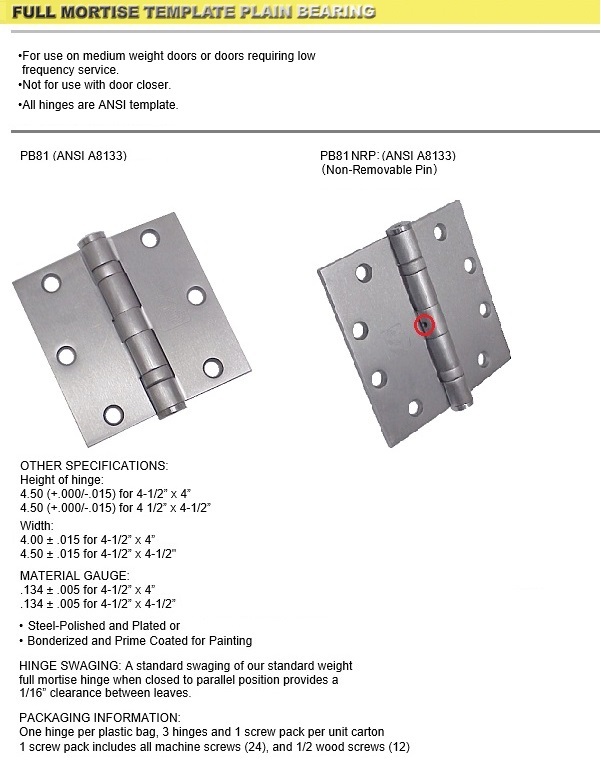 PB81 Hinges are full Mortised Architectural five knuckle with a four ball bearing hinge that are intended to be used in heavy duty applications where doors see high frequency usage. PBB, Inc. is a World Class architectural hinge manufacturer that takes pride in providing and maintaining high quality products that meet or exceed any standards in the field. PBB, Inc. template hinges are manufactured to close tolerances and meet all specifications and requirements set by the American National Standards Institute (ANSI)... Available in a variety of finishes, which allow you to match your existing hardware or décor to create that cohesive design.